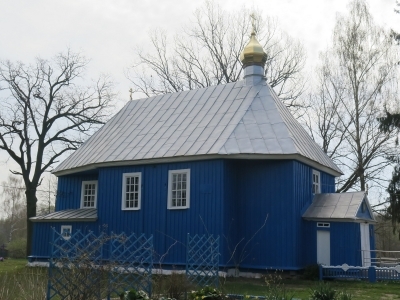 Worship wooden architecture (17th -18th centuries) in Polesye is part of the Tentative list of Belarus in order to qualify for inclusion in the World Heritage List. Arriving at Zditovo you don't see any of the "Street light posts, benches, and refuse bins were designed and manufactured following the ensemble concept of the avenue." Is there another Zditovo or did they hide this place? Okay maybe I just missed that but I was certainly at the St. Nikita Church unless they built two churches in 1502. Quick good check ensures me the striking blue church is the right one. It looks in good condition but I don't see the design uniqueness either. Naturally the church was closed for visitors so I just took a walk around. Definitely not seeking out the other churches on the proposed list: St. Paraskeva Church in Zbirogi, the St. Michael Church in Chersk, the St. Michael Church in Stepanki, and the St. Paraskeva Church in the village of Divin.